Maranello, Friday 11 October 2013 – Enzo Ferrari, the eponymous founder of the fabled Prancing Horse, once said that “A Ferrari is a dream. For most, it will remain a dream – except for those lucky few.” The 11 new teenagers who started their 3-year Ferrari Apprenticeship today are indeed “those lucky few”. Competition for a place on the Ferrari Apprenticeship scheme was understandably fierce, with over 1100 applicants from school-leavers who dreamed of working for the famous Italian Prancing Horse. 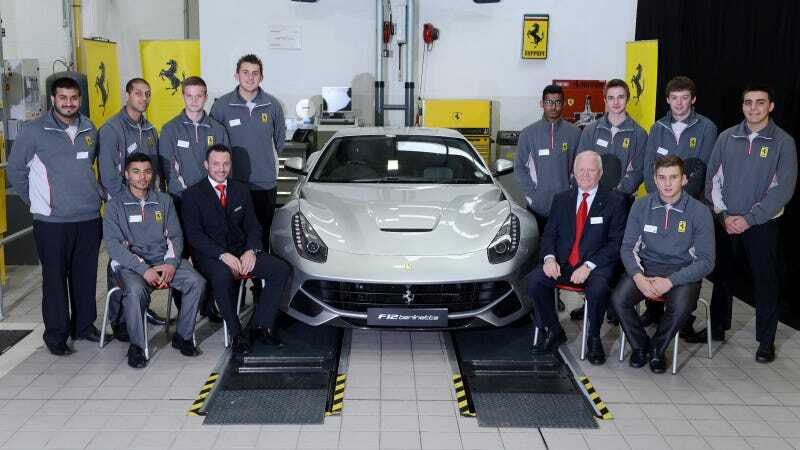 The new Apprentices will be employed at Ferrari dealerships throughout the UK, and will complete 24 weeks of training at Ferrari North Europe’s head office as part of their 3-year apprenticeship programme. During the 3 year programme, the Apprentices will receive intensive training on diagnostic and mechanical equipment required to service and maintain the current range of Ferrari models such as the Ferrari California, 458 Italia, F12berlinetta and the flagship FF. The Apprentices will also have access to other models from Ferrari’s recent past, including the F430 Coupe and 612 Scaglietti, to ensure they have the necessary skills to confidently service the cars they are most likely to see in the workshop at their respective dealerships. Demonstrating the success of the programme, the 4 graduating Apprentices have all been employed full-time as fully-qualified Ferrari Technicians in the Official Dealer network. However, completing the Ferrari Apprentice programme is not the end of their training regime with Ferrari. In fact, Ferrari has one of the highest rates of training days per employee of any automotive brand, particularly for technicians, due to the very complex, unique and highly-advanced technology which is featured on the current product range – much of which has been developed through Ferrari’s experiences in F1. This means these Ferrari Apprentices – now Ferrari Technicians – will continue to receive on-going training at Ferrari North Europe, as part of a structured career development path for their entire career – as we constantly need to train technicians on new processes, methods and technology every time we introduce a new car.